Author Adam Rubin and illustrator Daniel Salmieri are visiting this morning to talk about their newest book, Robo-Sauce, just released by Dial last week. 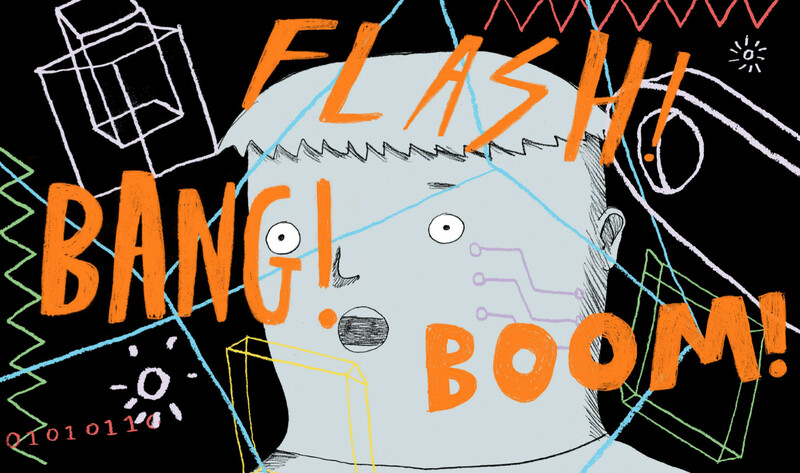 It’s the story of a boy who drinks a sauce that turns him into a robot, and after he concocts a robo-laser of sorts, he turns everything around him into a robot — including the very book he’s in. 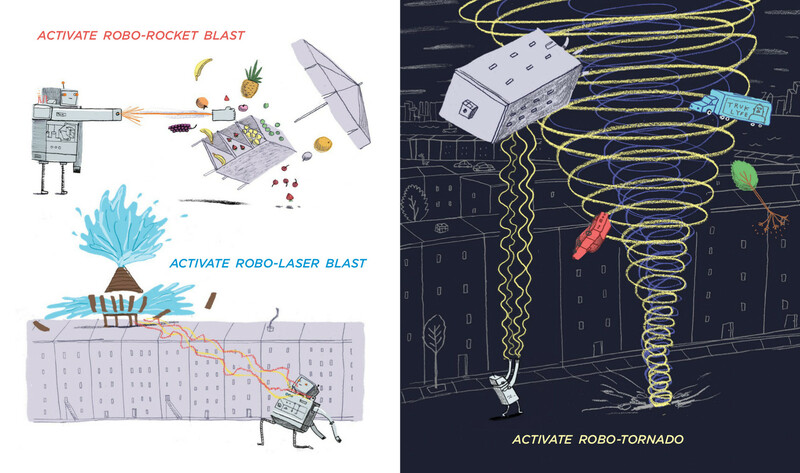 That’s right: The book has a one-of-a-kind moment—a sort of hybrid fold-out and dustjacket all in one with clear instructions for readers—that transforms the book into a robo-book. If you’re confused right about now, you can either a) read below, where Adam discusses this moment in the book; b) look at the images below of the fold-out moment itself; or c) watch Betsy Bird’s video about it. Better yet, find a copy of the book and experience it for yourself. It’s pretty great, and the story is very fun. 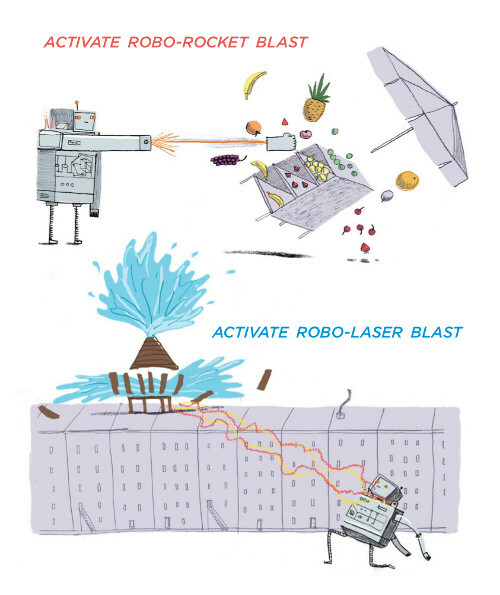 Our chat today is rather Robo-Sauce-centric, but maybe I can have these two back to 7-Imp another day to talk about the mighty funny Dragons Love Tacos (2012), not to mention this year’s Meet The Dullards, written by Sara Pennypacker (with art by Daniel here at 7-Imp). I also failed to ask them what their fascination with sauces is (salsa, robo-power-inducing sauce), so I’ll ask them that next time too. I thank them for visiting. Dan: Hi, Jules. Thanks for having us. 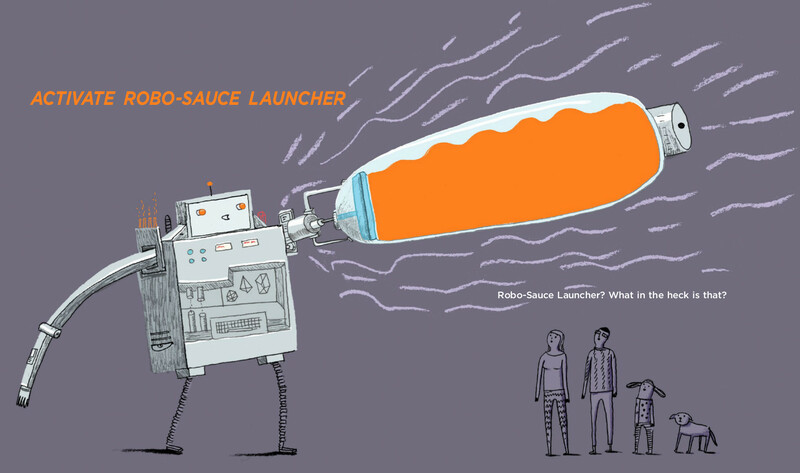 We’re so glad you like Robo-Sauce! I’ll let Adam field this one. Adam: Well, it all started with a somewhat disheartening feedback session. 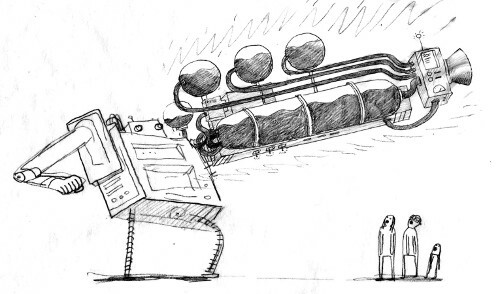 I had just shared an early manuscript of Robo-Sauce with our editor Kate, and she wasn’t really digging it. 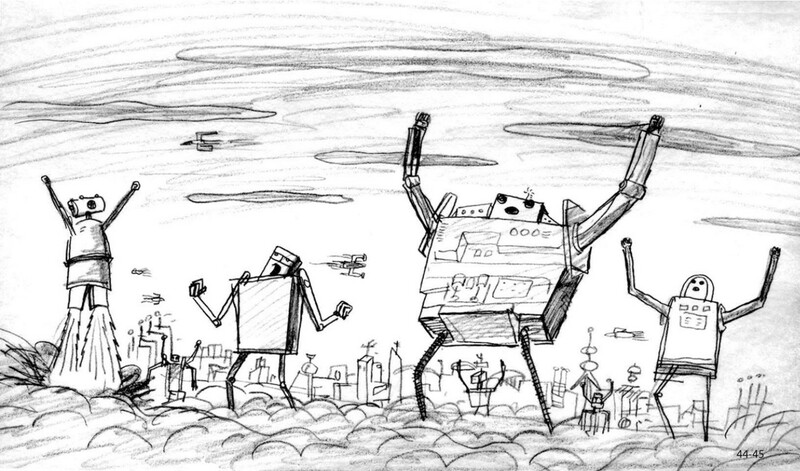 In that early version, the kid turned into a robot and went on a rampage, but the narrator reined him in pretty quickly. “Couldn’t it be a little more unexpected?” Kate asked. Ouch. I had worked on that story for months. We sat in awkward silence, as I realized she wasn’t interested in publishing the book. “What if everything turns into robots?” I said. Kate looked intrigued. 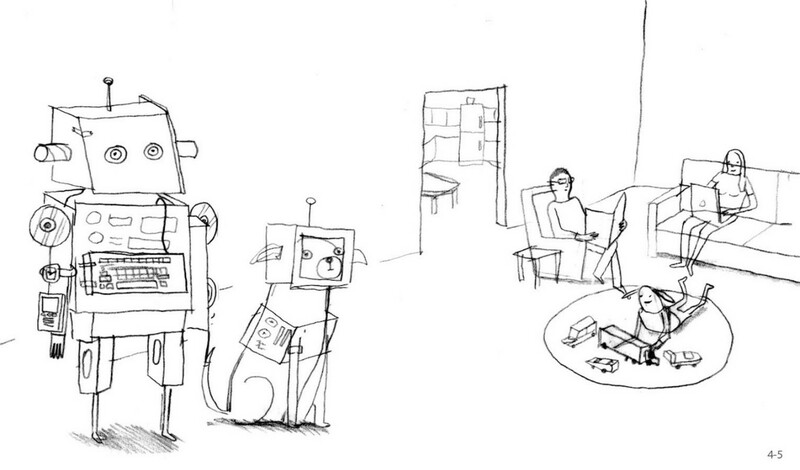 “The dog, the parents, the house, the food, even the narrator turns into a robot.” Kate looked excited. “Then the robots take over the world! 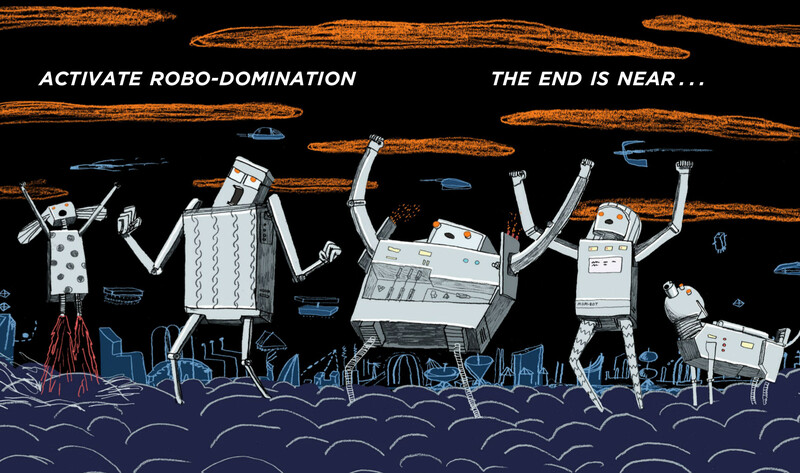 It’s a robo-apocalypse! 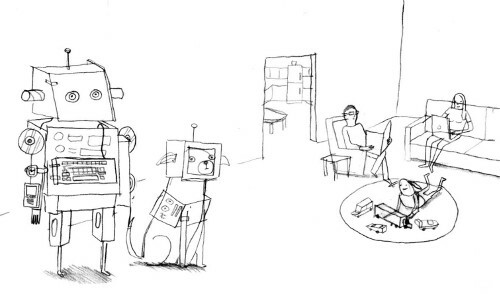 And at the end, the whole book turns into a robot.” Kate looked concerned. “What do you mean ‘the whole book turns into a robot’?” she asked. I know this sounds crazy but in that moment, I could see it. I could see exactly how the thing might work. I tried drawing a diagram, but Kate was understandably skeptical. I left the meeting and went over to Dan’s studio to try to build a prototype. I had a vision in my head, but I wasn’t sure if it would work. 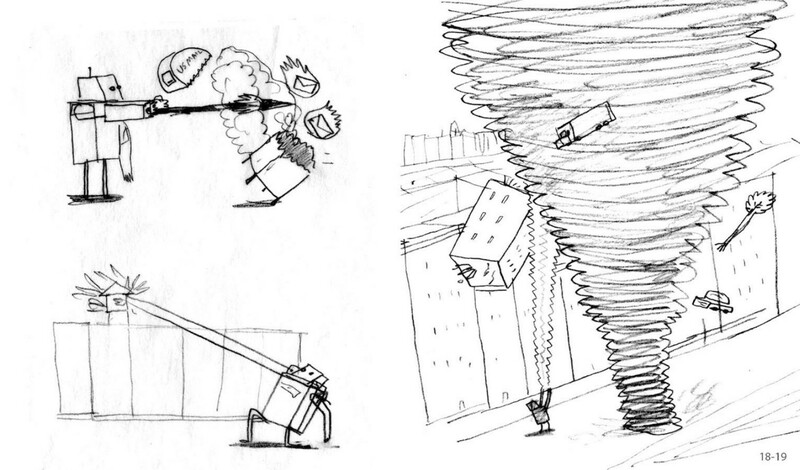 I made a tiny version the size of a postage stamp, filled it with terrible doodles, and gave it a try. It worked. When I showed it to Dan, he got really excited. Dan: Those doodles were awesome. And yes, it’s true, I became hyped. Adam: A few weeks later, I was back in the Dial office, tiny prototype and revised manuscript in hand. I took Kate through the new story, and she was pumped. When I explained the mechanics of the fold-out (basically a centerfold that wraps around the book to become a dustjacket), her enthusiasm waned. “This might get expensive,” she cautioned. “It would be really cool if the fold-out was foil stamped and shiny,” I said, completely ignorant to the realities of the modern publishing business. Just then, Lori Hornik walked in. Lori is the head honcho at Dial. I explained the story to her and demonstrated the fold-out transformation. “We have to do this,” she said. Dan: Dial was super supportive of this project. We collaborated closely with the design team throughout the process on all of the many choices that needed to be made in order to build a book that successfully transforms into another book. Adam: It’s been really satisfying to watch readers respond to all the surprises in the book. When the transformation happens in their hands and the book starts over, it’s like a magic trick. Early sketch and final spread: “Hey, kid! Sweet Robo-Costume. Jules: That’s a good way to put it (magic trick). And it’s impressive that Dial ran with this and took this chance. I think my favorite part (other than the phrase “whomping on squishy humans”) is when the narrator tells the boy/robot that he’s supposed to realize that he misses being a human. I love how this moment subverts the picture book plot we see all too often — the kind that would have had the boy do precisely that (learn the error of his ways, that is). It’s one of the reasons I’m glad you two make books for children: Your stories are always fully on the side of children and don’t patronize them. It’s so refreshing. I don’t know that I have a question here, other than to say I’m glad you didn’t go into, say, iceberg-moving. (I read the other day that this is an actual profession.) Did you always you know you wanted to write and illustrate books for children? How long have you known each other and how’d you first end up collaborating together? That’s three questions in one. Sorry. Dan: Thanks so much for saying that about our stories. 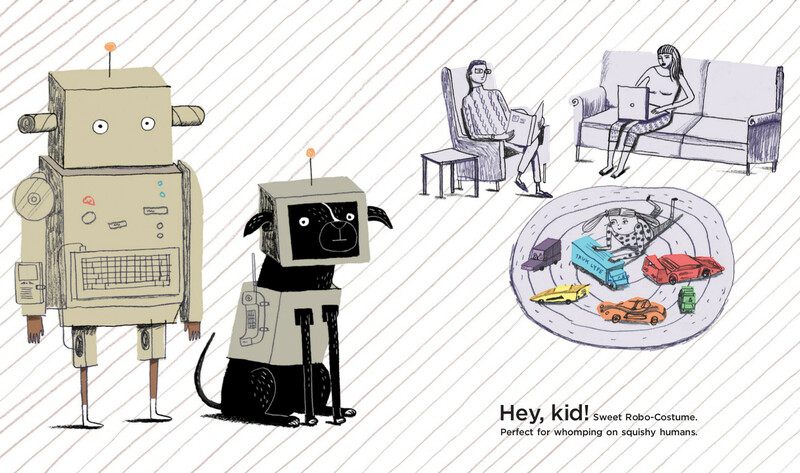 We try to make books that we’d have connected with as kids. We tend to gravitate towards stories that don’t have obvious lessons or predictable story arcs. 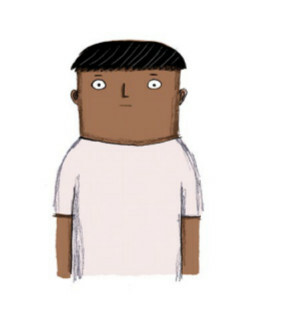 Daniel: I didn’t always know I wanted to illustrate for children’s books, but I always knew that I wanted to be an artist. I loved to draw and paint as a kid, and later on in art school I gravitated towards illustration, because I like telling stories with my pictures. Although I didn’t always know I wanted to make them, children’s books were always very important to me, growing up. I loved having them read to me as I looked at the pictures. I was transported deep into the story and the world of a book in a way that felt magical. With regard to later wanting to make them myself, I think that an early seed was planted in the fourth grade. Jon Scieszka came and did a presentation for my class, and I was blown away. 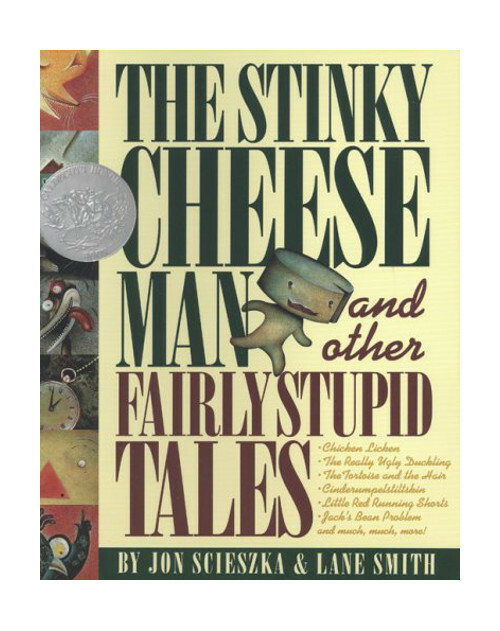 The Stinky Cheese Man was one of my all time favorites for its grit and weirdness — and for being rude and unapologetic about it. Jon was so funny and charming during the presentation. It may sound silly, but that was when it clicked for me that there were real people making these books, and that was what they did as their jobs. Adam and I have known each other for nine years. We were introduced (via email) during my senior year by our mutual friend, Corey. I grew up with Corey in Brooklyn, and he and Adam had just graduated from Washington University in St. Louis. Corey saw me and Adam as people who wanted to do creative things who had complementary sensibilities. 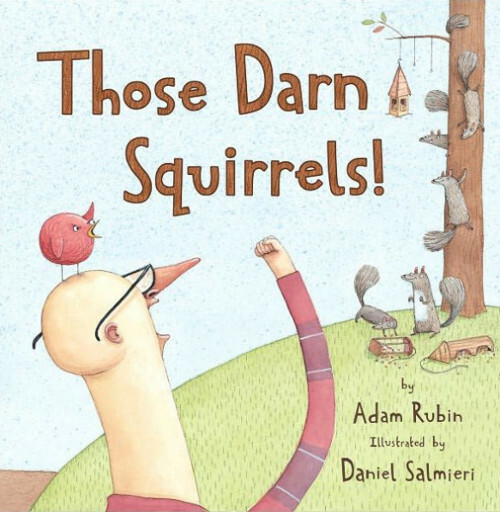 Adam liked my illustrations, so he wrote Those Darn Squirrels to show to me. I loved his sense of humor and knew I wanted to work with him. I think that’s a big reason why we collaborate well together — we find each other’s work really funny. After graduating, I was going on a bunch of portfolio reviews at publishing companies, and I brought the manuscript of Those Darn Squirrels and some sample illustrations I had made to accompany it around with me. Clarion picked up on it, and Adam and I have been working together since. Adam: I never would have written a picture book if it wasn’t for Dan. I was writing Happy Meal commercials for Leo Burnett and doing shows at the Annoyance Theater in Chicago when we met over email. I saw Dan’s illustrations and thought, “I have got to work with this guy.” It’s crazy how what started as a fun side project has grown into my full-time job and a deeply fulfilling passion. It kind of makes sense, looking back. I always admired great picture books — Tomi Ungerer, Shel Silverstein, Jon Scieszka. (I never met him as a kid, but I remember buying The Stinky Cheese Man from a Scholastic book fair when I was in sixth grade.) I was obsessed with the early Klutz books — magic, juggling, kids’ shenanigans. They were so conspiratorial. It felt like, as a reader, I was in cahoots with the writers, and I guess I try to emulate that feeling in our books. 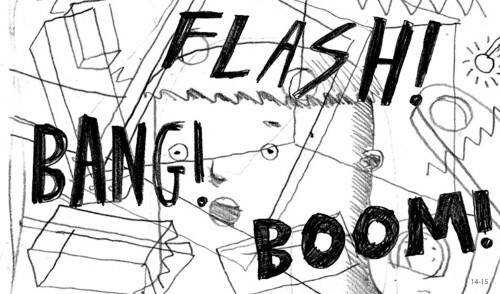 Picture books are an amazing creative medium, because there are so many constraints and such a wide audience. (We know full well that it’s not just kids who read them.) So, instead of trying to guess what four-year-olds or eight-year-olds or elementary school librarians might like, we just write and draw to make each other laugh. We genuinely love what we do and hopefully it comes across in the work. Jules: I always find that question of audience so interesting. Most of my favorite illustrators say, as you do, that you don’t write and illustrate books with a child audience in mind. That is, you create what you think works (and, in this case, is funny), and it works for children too. Or that your audience is children but that they are, in many ways, very much the same as adults. I interviewed Liniers recently, who said, “I never want to pander or patronize kids. They aren’t idiots. They’re just below eye level.” I love that. [It and other books] showed me that below the dollhouse of children’s literature there was a semi-finished basement where people drew funny pictures and tried to crack each other up, and there there was maybe a space free on their orange, beer-stained sofa. Adam: The Annoyance was one of my big inspirations to move to Chicago. I had read Mick Napier’s book in college and seen some astonishing improv shows at UCB in New York. The funny thing is: Adults spend years studying the forms and techniques, but any kid can do improv. They are totally fearless. And for me, the best improv happens when the people on stage are all playing with child-like abandon and just having a blast with each other on stage. 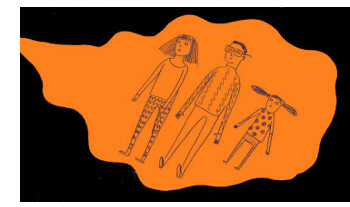 Jules: And improv is so good for children and their growing brains — on so many levels. Anyway, I’m glad you all met and joined forces and make books. 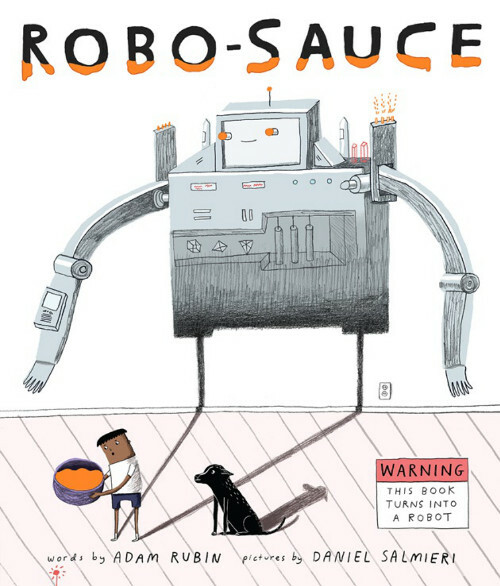 Back to Robo-Sauce: Have you shared it with children yet? What’s been their reaction? Adam: We’ve had a few opportunities to share the story with kids but mostly in large group settings at book festivals. I remember the first time we read it outloud, the audience laughed and clapped at all the right moments. It was kind of a relief. We work in isolation on these things for so long that sometimes we’re not sure how people will respond. Neither one of us has children, so we rely on friends and fans to tell us what their kids latch on to. So far, the reports say robo-dog is a huge hit and that “Flash, Bang, Boom” is quickly becoming a household catchphrase. Dan: The dog in the book is actually based on my real dog, Ronni. 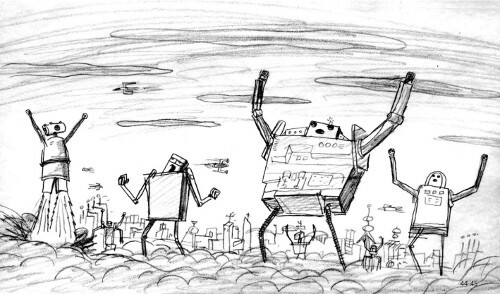 Jules: Does Ronni know he’s gone down in all of picture-book-dom history as a robot character? Did he get extra treats for this? Dan: Yes, she knows — and it’s going to her head. (She’s a girl dog. Ronni is short for Veronica.) She always gets extra treats! Jules: I can only imagine that tons of discussion went into precisely what would go on the big gatefold where you had to keep the action moving, yet you had to also include instructions. It totally works, but did it ever get overwhelming? Adam: In the original prototype I made, the pull-out spread was this hastily-drawn picture of the earth covered in stick figure robots. We kind of forgot about it and went in a different direction. It was actually one of the design folks over at Penguin who suggested we go back to it. Adam: Lilly is great. We worked with her and Jason down to the wire. I think I also have to give a shout-out to my old coworkers at Firstborn in NYC. I pulled a lot of patient folks into my office to watch them fail at folding, while trying to develop clear and concise instructions for the transformation. I learned a lot about information design. Some people only read words; some people only look at pictures; some people just wing it. It was a long process with at least fifty iterations. The inventor, Mark Setteducati (whom the book is dedicated to), provided a lot of valuable suggestions, but it’s a daunting challenge to instruct people through a process that they are not expecting and have never seen before. I just kept imagining confused readers across the country, ripping the book in half out of frustration. 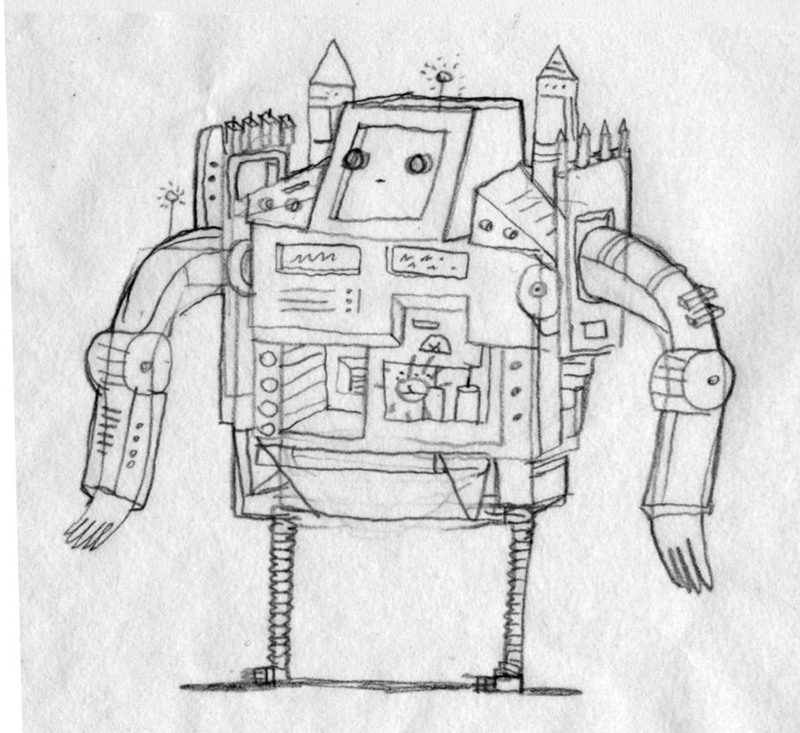 Of course, the first time I handed the book to a kid, they transformed it into a robot. No problem. He also made robot noises while folding, which I now realize is key. Jules: I am laughing so hard at this. (I guess I could just type “LOL,” like the rest of the world, but I’m a contrarian.) Yes, robot noises are necessary. Can you talk a bit more about Mark Setteducati and how you know him? Adam: Mark Setteducati is a world-famous magician and toy inventor. We met through our mutual interest in puzzles and optical illusions back when I was in college. A few years later, I wound up writing an article about him. Mark’s work has always inspired me, and he was one of the biggest advocates for me to leave my day job in advertising. Jules: That’s lovely that you dedicated the book to him. Well, this might be a good place to stop our chat. Stop it right by inspiration and very close to robot noises. Bleep bloop. Bleep. Thank you both for visiting. It was fun. Dan, thanks for sending art! Wait! One more question: What are you guys working on now? Anything you’re allowed to talk about? Adam: We actually have a bunch of exciting projects in the works. Some are fully-finished manuscripts, and some are still scribbles on the back of a bar napkin. Hopefully, Robo-Sauce catches on and we get to continue playing with the whole idea of the book as an interactive object. We both still love that old-school, tactile storytelling experience you can’t get from a digital screen. Maybe it’s ironic that we made a story about technology taking over the world, and the analog version is way better than the e-book. Jules: Looking forward to what’s next! Thanks again for chatting with me. Dan: Thanks so much, Jules. It was great talking to you! ROBO-SAUCE. Copyright © 2015 by Adam Rubin. Illustrations copyright © 2015 by Daniel Salmieri. 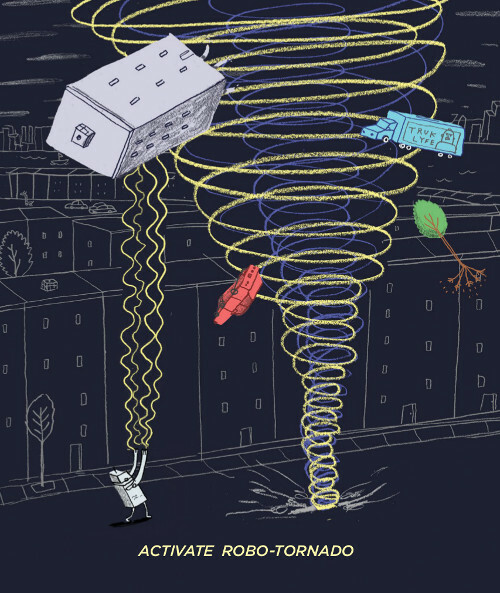 Published by Dial Books for Young Readers, New York. All images used by permission of Adam Rubin and Daniel Salmieri.